(Newser) – It may sound nuts, but an analysis at FiveThirtyEight lays out the longshot scenario of how the nation's next president could be ... Evan McMullin. As Benjamin Morris writes, the chances of the independent candidate claiming the White House "are slim, not none." 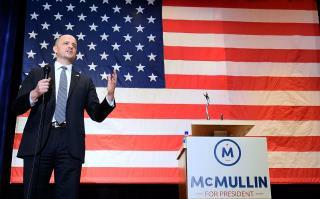 And it's all about Utah: A traditional Mormon conservative, McMullin has positioned himself as an alternative to Trump—and that may be a winning strategy in his home state, where Trump has acknowledged a "tremendous problem" rallying support, per the Deseret News. If McMullin snatches Utah's six electoral votes, he could prevent any candidate from collecting the 270 electoral votes required to win. In that situation, the election would be decided in Congress, opening up the chance for McMullin. Nooo. Gary Johnson. Come on. this election is rigged and has been from the getgo thanks to ovomit and hillary clinton! if anyone thinks otherwise is a fool. the two most corrupt people with the most corrupt administration in US history there's no way its not rigged for hillary!